Bike Hugger Visits Maui again! The blogger Bike Hugger visited Maui over the new year. 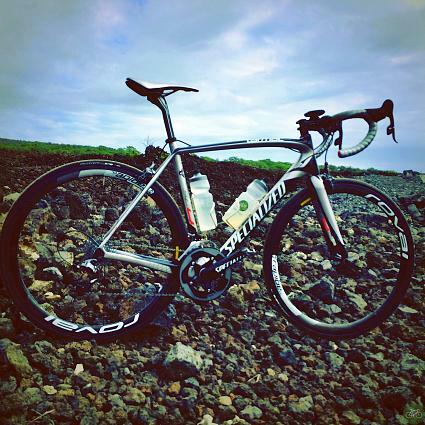 Specialized sent over a special colorway silver Tarmac Pro Race SL4 for him to enjoy on our amazing Maui pavement. Check out the "Maui" section of his blog to get the skinny on his two wheeled adventures. His Best of Maui 14 post includes a Google Glass walk through of the West Maui Cycles shop which is where this blurp comes from. He wasn’t Upcountry when I was, which is good, cause I get angry after tall, thin dudes pass me on climbs. It’s the pleasure of just riding a bike that I was really trying to reconnect with on Maui and not turning myself inside out. Did plenty of that in 13 and posted about it here. That’s the thing about Maui and why we enjoy riding there so much. You can ride like a tourist, have an epic day, or with their updated infrastructure, an errand ride to stock the vacation condo fridge for lunch. The rest of his adventures include a ride on Lanai, viscious trade/Kona winds, fruit stands and a whole lot more.